After a fourth away win of this year’s Vitality Blast against Middlesex earlier in the week, Sussex Sharks will look to open their home account today when they take on Somerset at the County Ground (2.30pm start). Jason Gillespie will pick from the same 14 that travelled to Lord’s for that fascinating encounter on Thursday night. 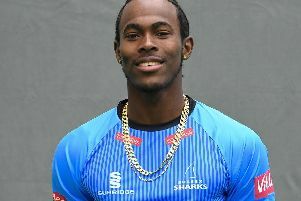 A Jofra Archer hat-trick – the first for Sussex in T20 cricket – sealed a famous victory at the home of cricket after Phil Salt had smashed a half-century off just 19 balls and Delray Rawlins made 49 on T20 debut. Salt’s effort saw him equal Stiaan van Zyl’s record for the fastest fifty for Sussex in T20 cricket. * Somerset sit in second place in the South Group having won six of their nine matches, more than any other team in the division. The men from Taunton have scored more runs than any over side in the south group, but have also conceded the most, perhaps saying something about the wicket at their home ground.